Vending air fresheners are perfect for placement in your vending machines. They are perfect for quick, easy access to your air freshener needs. 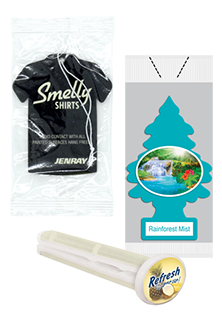 We have several brands including Smelly Shirts, Vent Sticks, and Little Tree Car Freshener. These air fresheners are perfect for any car and either hang perfectly from your rear view mirror or clip into your vents.. Come check out our wide variety of vending air fresheners. We have the lowest prices in the nation. GUARANTEED!